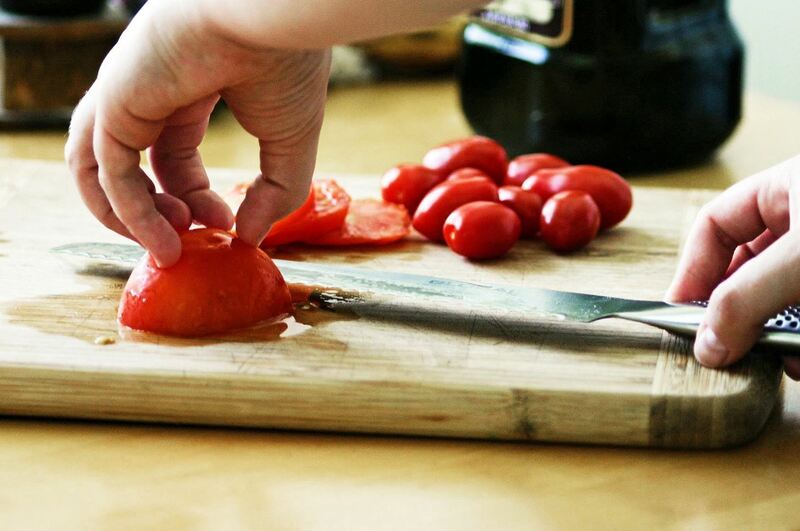 Tomatoes are the perfect barometer for kitchen knives and knife skills. If you've ever watched an infomercial for a set of knives, you've surely seen the enthusiastic host waxing about how well the knives cut tomatoes. 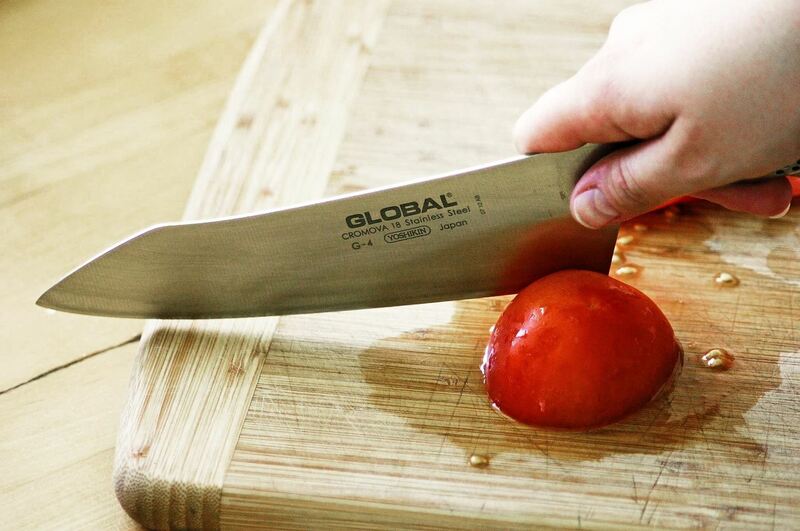 And if you've ever had your knives sharpened, you've most likely tested them out on a tomato. Tomatoes can seem impossible and infuriating to cut; for many, trying to cut a tomato with a knife yields roughly the same result as hitting a tomato with a cast iron skillet. But there are a few tips, tricks, and hacks for cutting tomatoes easily, beautifully, and without creating a mess. When I was a line cook, we had a very strict rule about serrated knives: use them on bread, use them on tomatoes, and use them on nothing else—ever. The reason for this is pretty simple: tomatoes and bread are very structurally similar. Both bread and tomatoes feature a soft, vulnerable inside that is protected by an outer shell (crust for bread, skin for tomatoes). Even a little bit of pressure to the protective outer layer can tarnish the inside of either product. As such, the goal in cutting each is to cleanly cut through the outer layer without squishing the inside. A serrated knife allows you to cut right through the tomato's skin without applying any pressure to the fruit, and thus keeps the inside completely intact. If you opt for a chef's knife instead of a bread knife (there's something inherently sleek about cutting a tomato with a chef's knife), you want to cut through the skin in one motion. Running your knife back and forth, like a saw, will ruin the inside of the tomato. Instead, start cutting with the back of your knife's blade; use the back to slit the skin, and then finish the cut in one movement. Trying to make whole slices of a tomato can be an increasingly difficult task. The first two or three slices will be relatively easy, but as the amount of tomato shrinks, it becomes harder and harder to cut it. When you're down to a third of a tomato, it is nearly impossible to keep the fruit's structural integrity intact while trying to hold it in place for your knife. So here's what you should do for your slices of tomato: cut them horizontally. After making your first slice, lay your tomato cut side down, and cut horizontally, as though you are filleting a fish. This is not only much easier, but also far safer. Halving cherry tomatoes is a little easier than cutting big tomatoes, but it's an incredibly menial task. Thankfully, there's a quick, easy, and safe way to cut a large amount of cherry tomatoes in half. Simply gather a handful of tomatoes in a single layer, and put the lid to a plastic container over them. 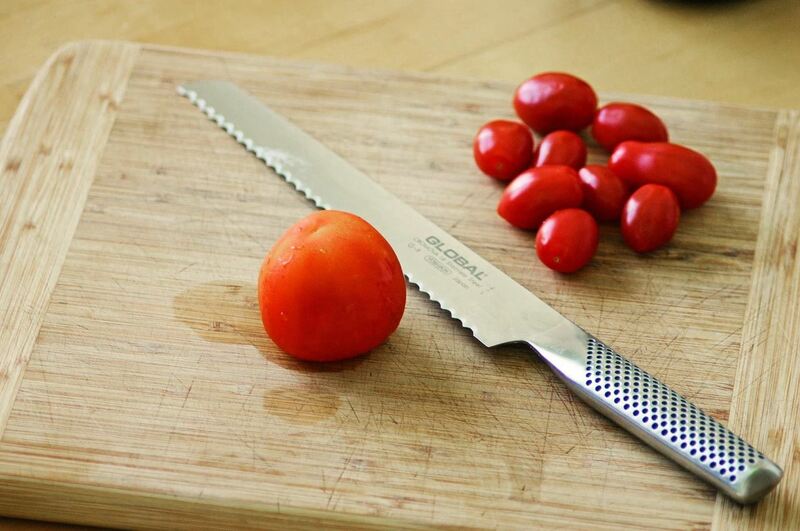 Next, run your knife (preferably serrated) through the tomatoes while applying light pressure to the lid. 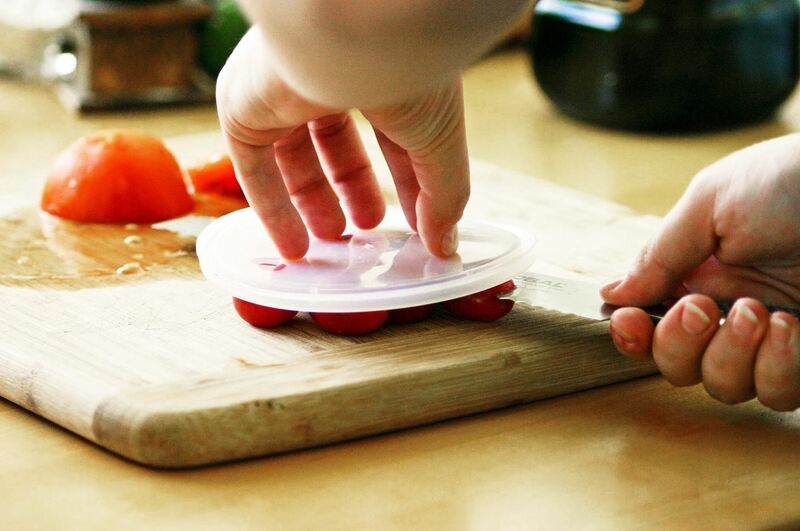 The pressure from the lid keeps the tomatoes in place, and one run with the knife will cut each tomato in half. The tops or bottoms of plates will also work. Of course, the best advice I have for cutting tomatoes is extremely simple: make sure your knives are sharp, and invest in some carbon steel. With or without perfectly sharp knives, however, you'll want to try these tips. Now that you know how to cut tomatoes like a pro, try your hands at onions, butternut squash, garlic, meat, stone fruits, and even ice cream. If you need a quick fix for a dull knife, try sharpening it on a coffee mug or even a newspaper—they work great in a bind. Also, if you feel like you're too dependent on your kitchen knives, try using your kitchen shears more! How To: Baked "Stuffed Lean Ground Pork Tomatoes"
Wow! Is there anyone out there who can't figure out how to slice a tomato? Think I'll post an article on how to blow your nose. No, wait! That's probably a little more complicated than how to slice a tomato. I'll post my blog on how to drink water out of a glass. That's my contribution to humanity for the day.